It's a couple months into the school year and my son- who's in playgroup- has finally given up the morning fight and tantrum, and willingly goes with his knapsack and a smile on his face to his classroom; this once fragile and worrisome morning routine has now become blissful. The few hours that I have in my quiet apartment to get blogging done has become my most powerful and productive hours; I made this salad within twenty minutes after dropping him off at his classroom, and finished my pictures and post with in the hour. Being productive is the best feeling and eating this salad after felt like the perfect reward. 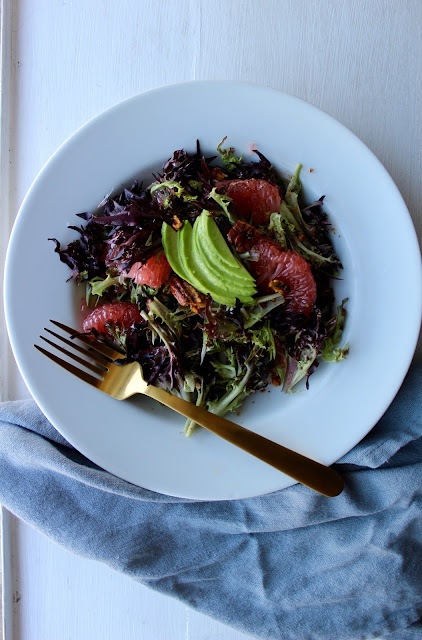 Each bite of this salad is filled with crisp, spicy, crunchy, and the citrusy cold juice of the grapefruit, making this salad taste precisely like winter on a fork. 1. Over a medium flame, toss the pecans, maple syrup, and one teaspoon cayenne pepper. Once pecans begin to become aromatic and toast- about four minutes- remove from flame and let cool. 2. Segment one grapefruit removing all the rind and peel. Set aside. 3. In a blender juice the second grapefruit, add the olive oil, remaining cayenne pepper, maple syrup, kosher salt, and black pepper. Blend until emulsified. 4. In a large bowl gently toss the lettuce, segmented grapefruit, half cup pecans, and half the dressing. Top salad with sliced avocado and remaining pecans. Add more dressing according to your taste. Sounds fabulous! Being productive and cooking keeps me sane and happy! In general im a big fan of grapefruit. Gotta get the rest of my eaters on board! !